A planning application for the removal of a red phone box in Cregneash has been submitted by Manx Telecom. Last year the company announced plans to decommission and remove six of the phone kiosks which is said were "unprofitable." More than 500 residents signed an online petition to persuade the company to reverse the decision. Campaign spokeswoman Christine Cowley said the phone boxes were an "iconic part of the community." 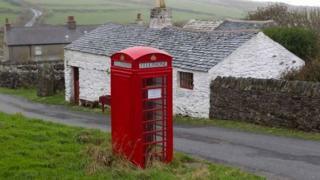 Cregneash site manager Helen Ashcroft added that the red phone box is a "real attraction for tourists." A Manx Telecom spokesman said: "If their annual revenue falls behind £10 we have to look again because it costs us £600 a year to maintain each one. "We appreciate that some communities have an emotional attachment but in the long term our customers are looking to new technology and that is more important to them than investing in phone boxes which are no longer used." So far Malew is the only local authority to save its phone box. It will pay £300 maintenance a year for the Derbyhaven kiosk because of its "possible emergency use in the active harbour". The red phone box was introduced in 1936 to commemorate the Silver Jubilee of King George V's coronation. There are currently more than 100 pay phones on the Isle of Man - about two thirds of those are the traditional red variety.